ConservationDrones tested a backpack for the FLIR Tau 2 Cores, which allows RAW digital data output from the FLIR to be recorded onto a USB stick (both video and stills). Not only is this digital video much clearer than a conventional analog output from the FLIR, but it also allows the user to read the temperature of each pixel on the video or still image using an accompanying ThermoViewer software! Additionally we can also parse flight data, such as GPS coordinate and altitude, directly onto the digital recording. Markus Ax and Stephen Thamke are the two young founders and managing directors of the Germany-based start-up, TeAx Technology, who kindly provided us with a demo unit of this ThermalCapture backpack that they developed. They are super responsive on the emails as well. For this particular test, we were using a FLIR Tau 2 – 324 with 9 mm lens at 8.3 Hz refresh rate. The FLIR core, ThermalCapture and a dedicated battery weigh only 233 g! They were carried by a 3DR X8 multirotor. 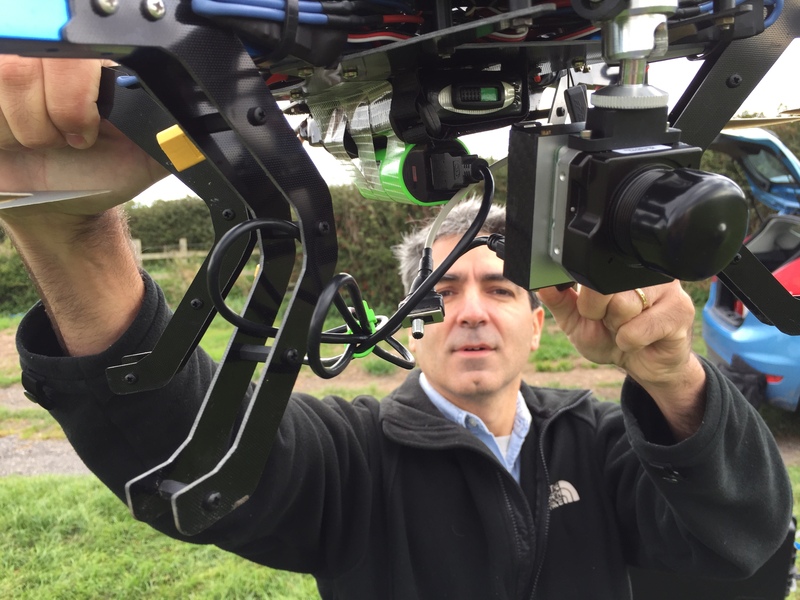 In the first video, it was flying at about 25 m above ground filming Serge Wich in the field. In the second video, the X8 started flying towards some cows in a field from about 100 m away. The FLIR Tau 2 core, ThermalCapture and battery weigh only 233 g! Wow. 233g for this set up is ridiculously light. I can see lots of exciting applications for this. Just thinking search and rescue – trying to find a lost bush walker or a missing child. This could eliminate a lot of open ground and allow resources to be used elsewhere. Yes, there could certainly be applications there. This is what I needed to count cranes at roost sites, where can I buy this? Hi Nyamba, write to Stefan at TeAx Technology. Mention you got their info from ConservationDrones. He should be able to help you. Is the technology capable of sending live video feed to a ground base? Yes, you can send a live link back to to the ground. Is it possible to estimate the size of animals? I imagine that to do so, it would be necessary to know how far the animal is from the camera. Is there a way to make that determination? One could write down the angle of the camera. Combined with the flying height and the camera information the distance can be calculated. Once that is done I think one can use pixel size to determine the size of the animal.